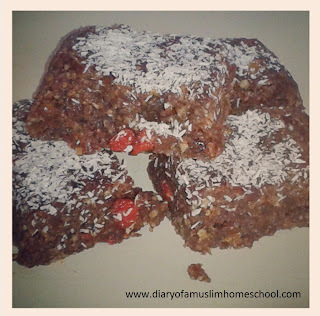 a muslim homeschool: Sweet n Sticky bites! Want to give the kids a sweet treat without the additives, MSG's and e-numbers that keep them bouncing off the walls? Try one of these sweet n sticky bites, a nutritious snack with all the taste! Ingredient quantities are approximate, alter as you feel necessary to get a consistency that will stick together and hold its shape. Grind the nuts in the food processor. After nuts and dates finely chopped and blended, add a few drops of water (as needed) to make sticky and bind together. Add the raw cacoa powder and blend to mix in. Add the berries and combine with hands. 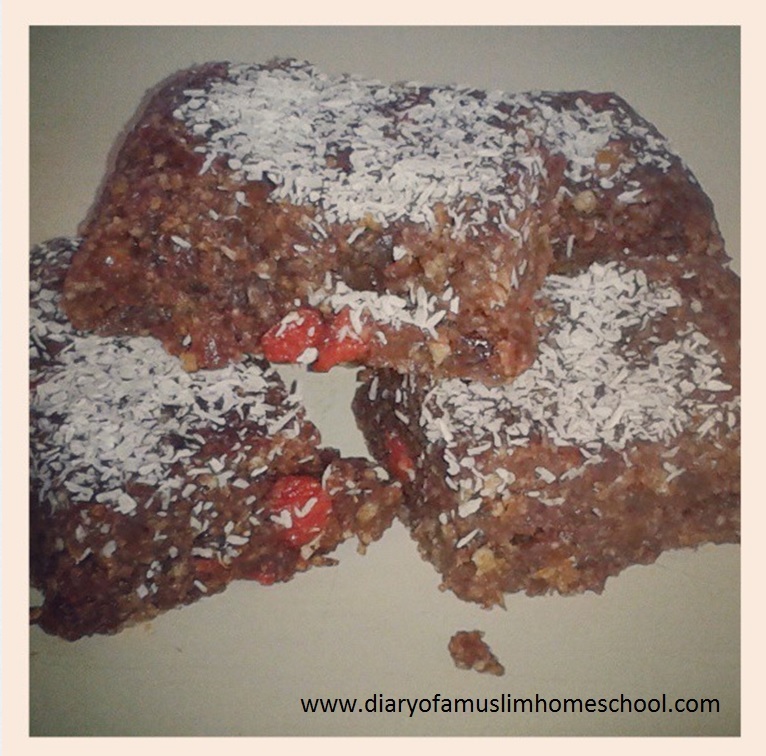 Sprinkle the dessicated coconut on top. Cut into bite size squares and refrigerate for about an hour before serving to allow the mixture to firm up. For variant recipies, you could try adding a few whole nuts or seeds to give abit of crunch, or a couple of spoons of raw honey!